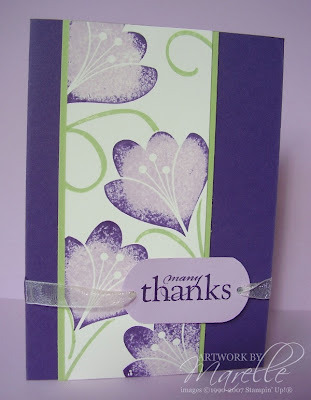 I've been rock'n'rolling a lot lately...it's a great way to add extra colour and dimension to bold stamps. You just ink your stamp in the lightest colour, then "roll" the edges of your stamp on the darker colour inkpad. Then I've masked the flowers so I could stamp the swirly stem. I made the "keytag" shape with my circle punch. I'm demonstrating how to do this at my Tuesday night classes this month, as well as lots of other punch tricks. There are still a couple of spots left if you'd like to book in! Great card, the colours are magic.